Bernard Hinault is "Le Blaireau," the Badger. Tough as old boots, he is the old warrior of the French peloton, as revered as he is feared for his ferocious attacks. He has won 5 Tours de France, marking his name into the history books as a member of cycling's most exclusive club. Yet as the 1986 Tour de France ascends into the mountains, a boyish and friendly young American named Greg LeMond threatens the Badger—and France’s entire cycling heritage. Known as "L'Américain," the naïve Tour newcomer rides strongly, unafraid. Asked by a reporter why he attacked his own teammate, the Badger replies, "Because I felt like it." and "If he doesn't buckle, that means he's a champion and deserves to win the race. I did it for his own good." LeMond becomes paranoid, taking other riders' feed bags in the feed zone and blaming crashes on sabotage. Through it all, with the help of his American teammate Andy Hampsten, LeMond rides like a champion and becomes the first American to win the Tour de France. His win signals the passing of cycling's last hide-bound generation and the birth of a new breed of riders. 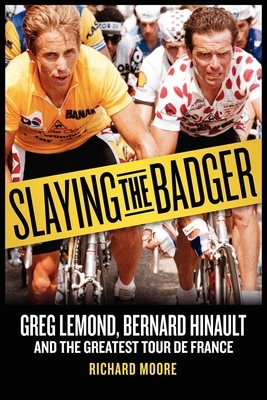 In Slaying the Badger, award-winning author Richard Moore traces each story line to its source through innumerable interviews—not only with LeMond and Hinault in their own homes but also with teammates, rivals, race directors, journalists, sponsors, and promoters. Told from these many perspectives, the alliances, tirades, and broken promises divulged in Slaying the Badger build to the stunning climax of the 1986 Tour de France. Slaying the Badger is an incomparably detailed and highly revealing tale of cycling's most extraordinary rivalry.